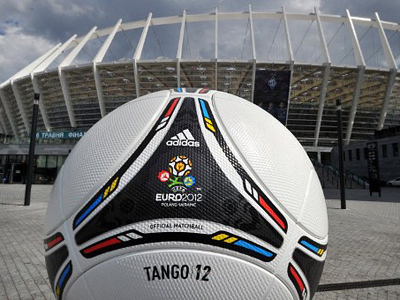 Racism has emerged as an early issue for the Euro 2012 tournament in Poland and Ukraine. The Dutch football team say they heard racist chants during their training session in the southern Polish city of Krakow. De Telegraaf reported that a handful of the 25,000 fans who turned up to watch the Oranje train made monkey noises at black players during the warm-up. The players moved their training to the other side of the ground. "It is a real disgrace especially after getting back from Auschwitz [the Dutch squad had visited the concentration camp on Wednesday] that you are confronted with this," Van Bommel said. "We will take it up with UEFA and if it happens at a match we will talk to the referee and ask him to take us off the field," he added. 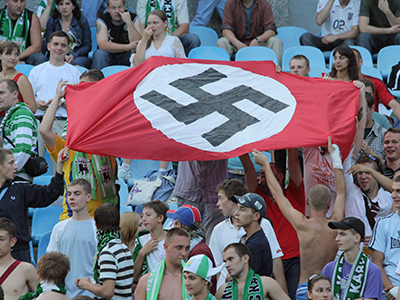 A senior UEFA official, however, tried to deny the demonstrations were racially motivated.. He said UEFA with its 'zero tolerance' approach had spoken to the Dutch squad and they said they had not seen or heard anything of a racist nature. Instead, the official said that some Polish fans were unhappy that Krakow had not been made one of the four Polish host cities for the tournament and made themselves heard. Van Bommel, however, responded angrily when it was put to him not everyone had heard monkey noises. "You need to open your ears," he said. "If you did hear it, and don't want to hear it, that is even worse." A journalist from Dutch radio RNW, however, maintained that some of the short-lived protest that was cut short by stadium officials was racist. The Dutch team’s captain is concerned the authorities are not treating the issue more seriously with the incident still threatening to be a major embarrassment for UEFA. The Polish authorities have been eager to downplay the incident. In an effort to show Poland is not a racist country Prime Minister Donald Tusk made a 90-mile journey to Lodz, accompanied by a TV crew, to dine with Poland’s first black parliamentarian John Godson and his family. The idea was to show the improvements of Poland's road network and acceptance of different races. But families of two of England's black players, Alex Oxlade-Chamberlain and Theo Walcott, have already decided not to travel to Poland and Ukraine. Former Arsenal and England defender Sol Campbell told BBC’s Panorama programme that Euro 2012 should not have been awarded to Poland and Ukraine, due to the racist and violent attitudes of some supporters. He advised fans to stay away from the tournament. "Stay home, watch it on TV… don't even risk it."